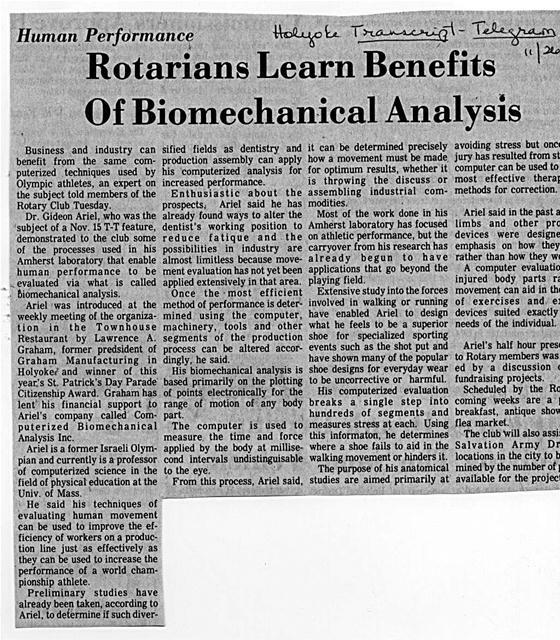 Performance to be evaluated via what is called Biomechanical analysis. Business and industry can benefit from the same computerized techniques used by Olympic athletes, an expert on the subject told members of the Rotary Club Tuesday. Dr. Gideon Ariel, who was the subject of a Nov. 15 T-T feature, demonstrated to the club some of the processes used in his Amherst laboratory that enable human performance to be evaluated via what is called Biomechanical analysis. Ariel was introduced at the weekly meeting of the organization in the Townhouse Restaurant by Lawrence A. Graham, former predsident of Graham Manufacturing in Holyokei and winner of this year's St. Patrick's Day Parade Citizenship Award. Graham has lent his financial support to Ariel's company called Computerized Biomechanical Analysis Inc.
Ariel is a former Israeli Olympian and currently is a professor of computerized science in the field of physical education at the Univ. of Mass. He said his techniques of evaluating human movement can be used to improve the efficiency of workers on a production line just as effectively as they can be used to increase the performance of a world championship athlete. sified fields as dentistry and production assembly can apply his computerized analysis for increased performance. Enthusiastic about the prospects, Ariel said he has already found ways to alter the dentist's working position to reduce fatique and the possibilities in industry are almost limitless because movement evaluation has not yet been applied extensively in that area. Once the -most efficient method of performance is determined using the computer, machinery, tools and other segments of the production process can be altered accordingly, he said. His biomechanical analysis is based primarily on the plotting of points electronically for the range of motion of any body part. The computer is used to measure the time and force applied by the body at millisecond intervals undistinguisable to the eye. it can be determined precisely how a movement must be made for optimum results, whether it is throwing the discuss or assembling industrial commodities. Most of the work done in his Amherst laboratory has focused on athletic performance, but the carryover from his research has already begun to have applications that go beyond the playing field. Extensive study into the forces involved in walking or running have enabled Ariel to design what he feels to be a superior shoe for specialized sporting events such as the shot put and have shown many of the popular shoe designs for everyday wear to be uncorrective or harmful. His computerized evaluation breaks a single step into hundreds of segments and measures stress at each. Using this informaton, he determines where a shoe fails to aid in the walking movement or hinders it. avoiding stress but onci jury has resulted from st computer can be used to most effective theral methods for correction. A computer evaluateo injured body parts ra movement can aid in the of exercises and ea devices suited exactly needs of the individual. Ariel's half hour press to Rotary members was ed by a discussion c fundraising projects. Scheduled by the Ro coming weeks are a 1 breakfast, antique show flea market. Generated on 4/24/2019 9:14:01 AM (PST) ADI/HQ/GBA/2019/ARIELCLOUD/v3.0.2018.0126.